Digital Transformation is "the use of technology to radically improve performance or reach of enterprises." 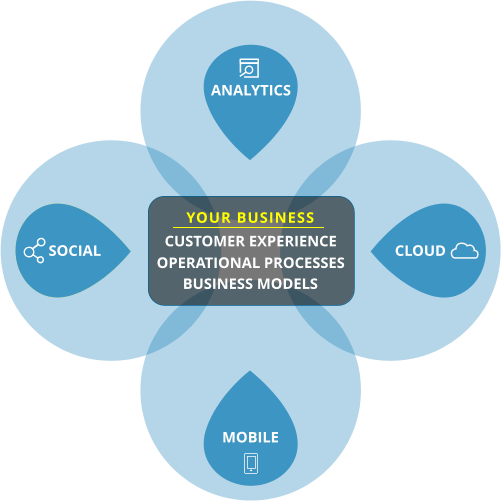 Transformation comes from enabling new types of innovation across three areas of the business: customer experience, operational processes, and business models. Artis can help you understand how social, mobile, analytics and cloud can enable top line growth as well as bottom line savings. Our Digital Transformation Quick Start and Design Sprint offerings enable your organization to quickly understand how Microsoft technologies can enable your digital transformation journey. Capture and analyze untapped data to transform your business leveraging Microsoft IoT Suite. intelligent action with Microsoft Cortana Intelligence Suite.